1) Be nice to everyone. Here's the thing—you never know who's going to become your friend. Whether someone has 1000 or 10 blog followers, it doesn't hurt to leave a nice comment on their blog and see where it goes from there. It's a little crazy to think how close I've become with a bunch of strangers overseas and strangers-that-have-become-not-strangers in my own city. Heck, I found out one of my bblogger friends literally lives a few minutes from my house...what the eff. 2) It's about the numbers and at the same time, not. Yes yes, it's a controversial topic and technically blogging should be for your own reasons, but at the same time, numbers represent an audience and perhaps a reflection of what you're doing right with the blog. The key part though, is having your numbers grow organically instead of force feeding your link down everyone's throats (follow 4 follow) because that is a pill I'm not willing to swallow, if you catch my drift. 3) Blogging develops and refines specific skills. I thought I was good at photography and Photoshop until blogging happened. Taking product shots, even with a DSLR, is hard, man. The arranging of props and product, editing and writing a blog post typically takes me a few hours to half a day depending on how many photos I have to edit and how much I have to write. Kudos to anyone who can churn out posts daily because I can barely keep up with thinking of topics and turning out corresponding posts. You people are tanks. It's also important to learn basic html so you can edit the layout of your blog; html isn't as difficult as it sounds. 4) Spell correctly. It's 'palette', NOT 'pallet', or 'palate'. 'Bear with me', NOT 'bare with me'. 'Pores' NOT 'pours'. How does this even happen? 5) Promote yourself. I've always been embarrassed by self-promotion, for realsies. But here's the thing—how else are people going to find your blog? Clearly not through their random dream where unicorns and leprechauns frolic through a field and throw your blog business card like a mardi gras festival (wat????). Twitter is a massive audience building platform if you use the right hashtags and participate in the chats. Also, it doesn't hurt to share fellow bloggers' links too. 6) Have a clean, easy to navigate layout. It doesn't have to be the stereotypical minimalist black and white layout, but as long as they layout looks good (i.e. doesn't hurt the eyes) and social buttons easily visible, you're ready ride into battle. Oh, and for the love of blush, please make your photos scaled appropriately to the text/blog layout. Tiny pictures in a giant wall of text make me sad because that's wasted potential. AND THE MOST IMPORTANT ONE OF ALL- MAKE YOUR FONTS LEGIBLE. Tiny/cursive fonts aren't ~artistic~. I wear glasses, and if I need to blow up your page to 400% before I can read anything, well, I will blow YOU up. 7) Inject personality and develop your own style. I've read too many blogs with flat writing that tells nothing about the actual person. A little humour and cultural references in a post go a long way and make the author a little more relatable. 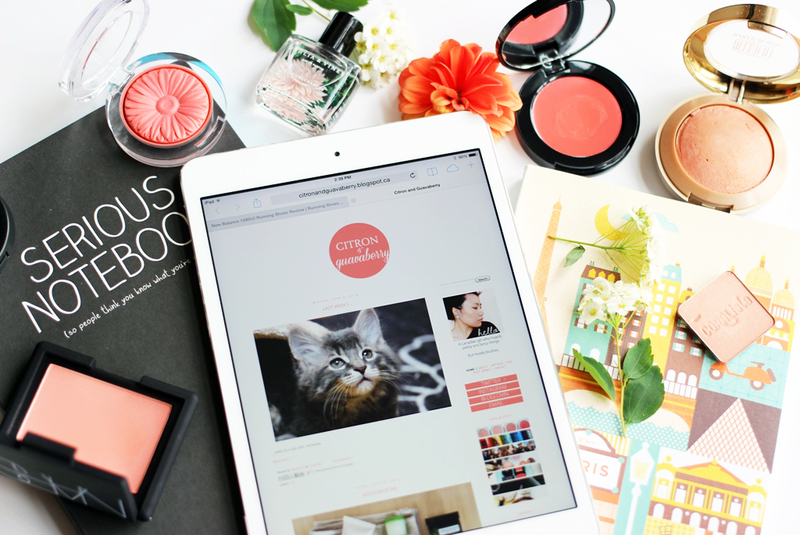 Too many beauty blogs look the same nowadays, so if you can, try to break away from the mould. I'm trying to work on that myself, but I work slow. 8) Be selective. Whether its about your content or PR opportunities, be selective about what you put onto the blog. I'd rather read a well thought out post than multiple lazy posts. Focus on helpful posts, as personally, I'd rather read post roundups than individual product reviews. 9) Post regularly. Alright, so I should take this advice myself, but committing to at least one post a week lets your readers know you're still alive. There really is nothing more exciting than having your favourite blog(s) release a post, so if you can get a post out every week, yay happy feelings! What's your favourite part about blogging?